Yesterday marked two months until the arrival of the first new Star Wars film in over a decade. Disney marked the occasion by not only releasing the official poster for the film, but several teasers for the full trailer that has debuted tonight during Monday Night Football (you know, what most Star Wars fans tend to watch on Mondays). Every other movie in town has pretty much cleared out sans the fourth Alvin and the Chipmunks film (yes, fourth!) which just decided to go head to head with the mammoth J.J. Abrams sequel that will see the continuing adventures of Luke, Han and Leia and what are presumably plenty of new characters given the expansive cast. It's been six months since the last trailer dropped for the film in the midst of the Star Wars celebration that took place in Anaheim, California, but now we have what I assume to be the final trailer before the actual release of the film and the reality of there being a new Star Wars movie just over the horizon is finally becoming a reality. While I was going to try and resist paying attention to what this trailer might hold the anticipation is unbelievable and I couldn't help but to divulge every bit of this glorious clip several times already. Things of note are the surplus footage of antagonist Kylo Ren and our first glimpse at Princess Leia, but still no sign of Luke. The film stars Mark Hamill, Carrie Fisher, Harrison Ford, John Boyega, Daisy Ridley, Oscar Isaac, Adam Driver, Lupita Nyong’o, Gwendolyn Christie, Domhnall Gleeson, Andy Serkis, Warwick Davis, Kenny Baker, Peter Mayhew, Anthony Daniels and Max Von Sydow. 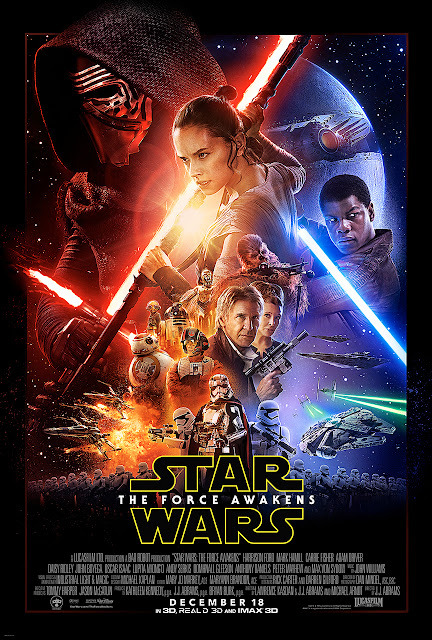 Star Wars: The Force Awakens opens December 18th. Synopsis: Star Wars: The Force Awakens, opens in theaters December 18, 2015. Star Wars: The Force Awakens is directed by J.J. Abrams from a screenplay by Lawrence Kasdan & Abrams, and features a cast including actors John Boyega, Daisy Ridley, Adam Driver, Oscar Isaac, Andy Serkis, Academy Award winner Lupita Nyong’o, Gwendoline Christie, Crystal Clarke, Pip Andersen, Domhnall Gleeson, and Max von Sydow. They will join the original stars of the saga, Harrison Ford, Carrie Fisher, Mark Hamill, Anthony Daniels, Peter Mayhew, and Kenny Baker. The film is being produced by Kathleen Kennedy, J.J. Abrams, and Bryan Burk, and John Williams returns as the composer. Star Wars: The Force Awakens is Episode VII in the Star Wars Saga.